Occasionally, objectively reviewing a product is tough. Take Apple's new laptop, the Macbook Air - how do you objectively review a machine which can cost two thousand pounds, yet manages to be the single slowest computer the company sells. Do you benchmark it? Comment on how it looks? Test to see how useful a very thin aluminium slab can be at performing household tasks? Well into the realms of subjective opinion, it's impossible to adequately explain with mere graphs and charts whether a system is worth buying. I'm in a very similar situation with the latest box to arrive from HQ - a VIA EPIA-PX10000G Pico-ITX board. 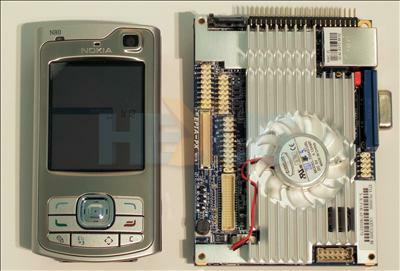 This is a very, very, VERY tiny little motherboard with integrated CPU, sound, and graphics. Weighing in at around the £160 mark at retail, the same money could easily buy you an Intel or AMD setup which would outperform anything in VIA's EPIA range - even a system the size of VIA's older size king, the Mini-ITX form factor. And yet, for some of you out there (especially the case modding crowd), the prospect of a computer this minuscule really IS worth sacrificing the performance gained by Intel or AMD offerings. Not to mention the power issue - a Pico-ITX board like this will cost mere pennies to run, with its low power drain, compared to a "full" desktop system. So I won't be showing any of the usual benchmarks in this review. There's really no point. For one thing, HEXUS's benchmark suites are designed for modern CPUs with multiple cores and 64-bit computing, and this platform can't do either. This will be an entirely subjective review, for an entirely subjective platform. Since really this is an embedded system (and long-time HEXUS readers may have noticed the name at the top of the page by now), I'll be trying it out with a few Linux-based scenarios. Technology watchers may have noticed the attention Linux based systems have received recently, especially from ASUS' diminutive EeePC, so I want to see whether another small-and-not-overpowered system can make the cut, or whether it's simply not got enough CPU grunt to find a comfortable niche.